I am probably one of the largest collectors of all things vintage Chattanooga Lookouts. There may be others out there as big but I know one great collector that owned a collection of all things Chattanooga baseball that would rival my small personal museum. While I was in Chattanooga for the week of Thanksgiving, this collector was holding a sale of his collection. I knew of a few pieces he had that I wanted and I contacted him for some pre-sale negotiations. One of the items I purchased was previously unknown to me. It was a side-written bat. I find side-written bats particularly interesting, especially if they are related to former Lookouts players. A side-written bat is simply a bat that was sent to Hillerich & Bradsby (aka Louisville Slugger) to be used as the model for the making of bats. When the bats were received, they would be written on with a black grease pencil with the players name and date received. Sometimes the team would be noted as well. These bats were used on the lathe to make an identical copy and the original would be stored in the warehouse for future orders by that player. The story of this bat begins in the small north Georgia town of Chickamauga, GA and with a player named Clarence “Cap” Crossley. Only 60 years before this bat was turned, Chickamauga was the site of one of the largest battles of the American Civil War, or as we call it in the South, the war between the states, as there was nothing civil about it. The town hasn’t changed much since the early 20th century and I can imagine the building that was the birthplace of this bat is still standing. This bat must have been a special bat to Clarence. It isn’t your typical Louisville Slugger bat. In fact it isn’t a Lousiville Slugger at all. Upon first glance, it appears to be a vintage pre-war bat that was taken care of. Its clean and without major damage. It has a rich dark patina that you hope to find on every vintage game-used bat. It features a “Hornsby” style knob that isn’t seen much in baseball today. I believe they also call this type of flared knob a “Clemente” style knob, too. While it may look like a typical bat from this era, It was specially made for a hardware store under the name of “R. 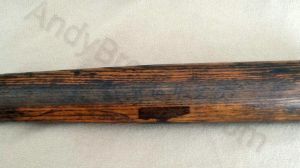 Stogsdill of Chickamauga GA” The bat brand is in a similar oval style to Louisville Slugger. It carries a “HY POWER TRADE MARK” designation. 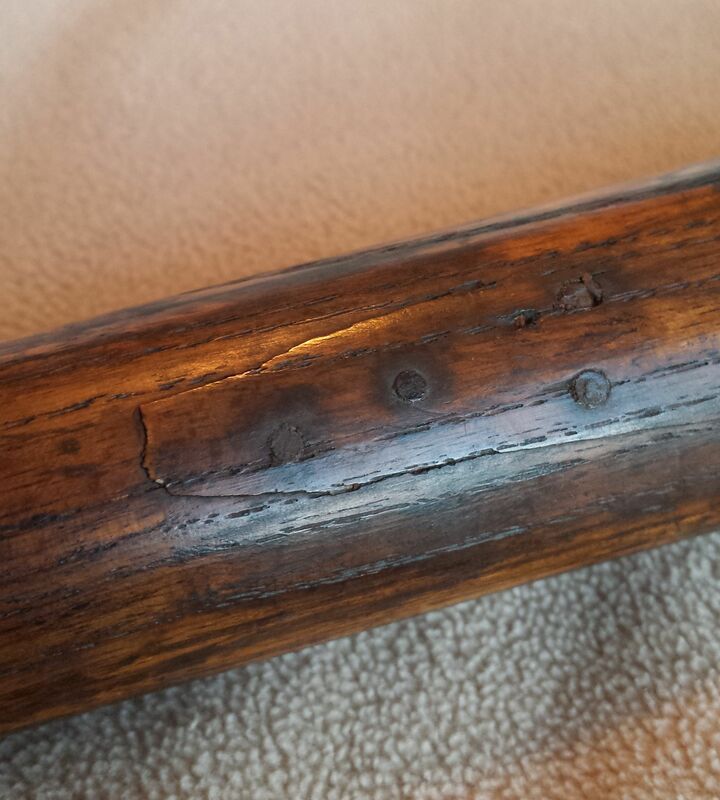 Adding to the evidence of it being a game-used bat is the batboy repair. It is a clean and professional repair to a crack in the handle, complete with nails. By June of 1925, the bat must have seen enough action and Clarence thought it was time to get himself his own model bat from Hillerich & Bradsby. Above the bat brand is the remnants of a mailing label. The bat was simply labeled with address and postage and dropped in the mail. Once the bat reached the Hillerich & Bradsby factory, it was side written with Clarence’s name and a date of June 1925 and placed in the warehouse to wait for Crossley to order bats. 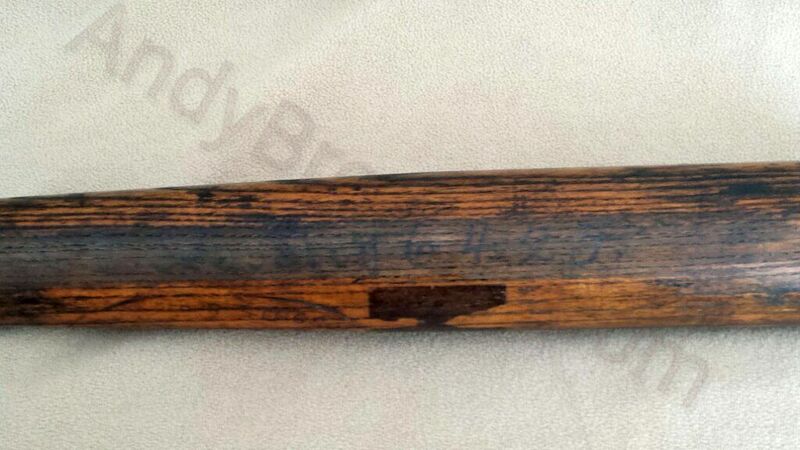 It is assumed that this was his bat during the 1924 and ’25 seasons with the Lookouts. The fact that it was turned only a few miles south of Chattanooga backs this thought. Not much is remembered about the career Minor Leaguer Clarence Crossley other than his baseball record. We know he was born in 1902 and played in the bush leagues for 18 seasons. After his playing days he was a manager and even spent a few years later in life as a scout for the Reds and the White Sox. Side-written bats can provide not only important reference information when dealing with valuable bats such as those used by Babe Ruth and Ty Cobb but also determine value of a bat that could have historical significance. A bat that belonged to a Black Sox member that is side-written after 1920 would be worth less than one with a date before their banishment from baseball. Sometimes the date can determine the value. Side-written bats can also add to the story. Every bat tells a story. From ball marks and cleat marks to nails and cracks, every bat is a part of baseball history. And so many stories are lost to the ages. Even players can be largely forgotten. Sometimes all we have today is what they left behind in the vaults of Hillerich & Bradsby. Previous Article Everyone’s Wagner is real, right? We all want to find treasure.